Today, we give you a list of some of the most popular, enjoyable, yet quite simple verbal drinking games you could play while at a house party, in bars, college dorms etc. Whichever game you pick you’ll get 100% of guaranteed fun. You can play by the rules as well as bend them or invent new ones, it’s your call, everything counts as long as it’s fun. Requirements: 4 players, plastic cups, 1 ping pong ball, ping pong table (or similar), mainly beer or beverage by your choosing. Instructions: One of the most popular verbal drinking games without cards or dice played on college campuses and house parties – Beer Pong, is played with two teams consisting of 2 people per team. Each side has set of six cups, each 1/3 filled with beer in front of them, arranged in a triangle (like bowling pins). The teams should sit opposite of the table. The goal of the game is to eliminate all of your opponent’s cups before the cups on your side of the table are eliminated. Both players on the team shoot, before the other team gets to shoot. As you take your turn, you must throw the ping-pong ball across the table into the opponent’s cups with beer. 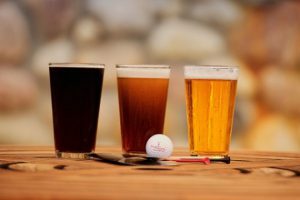 If the ball hits a plastic cup with a beer in it, one of the players of the defending team must remove the ball and drink the cup with beer immediately. The remaining cups are rearranged so they are close to each other. The winning team is the first one that’s going to eliminate the opponents cups. At the end of the game, the losing team drinks the remaining cups with beer of the winning team. Requirements: Best played with 8+ players, plastic party cups, long table, mainly beer or beverage by your choosing. Instructions: This game can be played by even teams of 4 or more people. Each team lines up on one side of the table and in front of every single player is a half cup of beer or other drink by choice. The 2 people facing each other on opposing teams, at the far end of the table start by tapping their cups together and then drink their beers. Once one of the players is finished with their drink, they put the empty cup on the edge of the table and try to flip it upside down with their fingers. If they fail, they try again until they succeed. As soon as they flip it, the teammate next to them can start their turn. The winning team is the first team to finish flipping all the cups. Requirements: 2+ players, Jenga wooden blocks, beer or beverage by your choosing. Instructions: This is one of those drinking games without cards or dice or cups and the rules are the same as regular Jenga. You take turns in removing one block at a time from the bottom of the tower and place them on the top of the tower, without knocking the tower down. If you successfully move a block, you may command another player to drink. However, if you knock the tower down you have to drink an entire beer. You can make this game even more tricky and diverse by writing different and interesting challenges on all of the Jenga blocks. This way, when the player successfully removes one block, the rule on that block is followed. And the person who knocks down the tower has not only have to drink down their entire drink they also have to pick two blocks to follow as an extra punishment. Requirements: Best played with 5+ players, an empty bottle, lots of shots filled with water, soda, and different liquor. 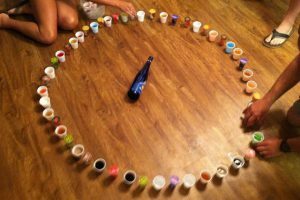 Instructions: One of the most popular drinking games with shots is the Shot Roulette. Find as many shot glasses as you can. Fill them with a different combination of alcoholic and non-alcoholic drinks. Arrange the shots with different liquor in a large circle. Place the empty bottle in the middle of the circle. Each player spins the empty bottle and drinks the shot the bottle is directed towards to. Requirements: Best played with 4+ players, liquor of your choice. Instructions: This game is pretty simple and great for breaking down those embarrassing barriers. All the players are sitting in a circle. It involves taking turns in asking questions in the form of ‘Never have I ever’ (like Never have I ever been to a nudists beach). Then, everybody that has done it has to drink and reveal that they’ve done it. Great opportunity to find out your friends embarrassing little secrets. Of course, everybody has to agree they will be completely honest before the beginning of the game and swear they won’t reveal and repeat anything they’ve heard to the outside world after the game finishes. We are not responsible if you play this game in front of your significant half – you’ve been warned! Requirements:Best played with 4+ players, liquor of your choice. Instructions: This is one of the best games for 3 people or more and it requires thinking and drinking. Oh my… that must be tons of fun! One of the players starts the game by saying a celebrity name ( actors, singers, historical people – as long as they are famous), the person on their left needs to name another celebrity whose name begins with the last letter of the previous celebrity. For example Neil Armstrong → George Michael→ Liza Minnelli etc. All the time while you think you must drink. This keeps going until one of the players repeats a name, can’t remember of one or speaks out of turn in this case he drinks a penalty drink and the game continues. Requirements: Best played with 5+ players, 1 big pint glass, coin, liquor of your choice. Instructions: This is a one of those drinking games without cards or ping pong balls, where each player puts some amount of their drink into the communal pint (known as the ‘Dirty Pint’) when it’s their turn. Then they toss a coin and call it. If they are wrong – down whatever is in the dirty pint. If they chose correctly, the dirty pint is passed on to the next player and he repeats the whole process. Instructions: If you consider yourself a lucky person and you want to get a free drink when in a bar then this is the perfect game for you. Players take turns in rolling a die. The first to get a 6 names the drink. The second to get a 6 drinks it. The third one pays it! Requirements: Any number of people may play, one die, coin, glass or plastic cup, plenty of drinks. Instructions: Place the coin and the die in the cup. The player shakes them up and puts the cup face down in front of the player on his left. Without looking, this player must guess whether the coin is heads or tails. If he guesses correctly, he shakes the cup for the next player on his left, if he fails to predict right then he takes as many drinks as are dots on the die. You can use two dice for a slight variation of this game if you are feeling very courageous and in the mood. Instructions: You start off by whispering a question to the person on your left, the answer of which must be somebody playing the game (e.g. ‘Who do you like the most in this room?’ ). The person who responds must answer out loud. If somebody is curious about what the question was, they have to drink. Note: These games are strictly for adults of the legal drinking age, who can drink legally. Drink Responsible And Do Not Drive After Playing One Of These Drinking Games Without Cards!